Stacy Pettigrew and Scott Kellogg outside the greenhouse at Radix. AOA is on summer break. So we'll have new follow-ups with people we've met and covered during the last year. A little more than seven years ago Scott Kellogg and Stacy Pettigrew won the very first AOA Start Up Grant competition with their plans for an aquaculture to grow fish and watercress at the [then] new Radix Center for Ecological Sustainability. 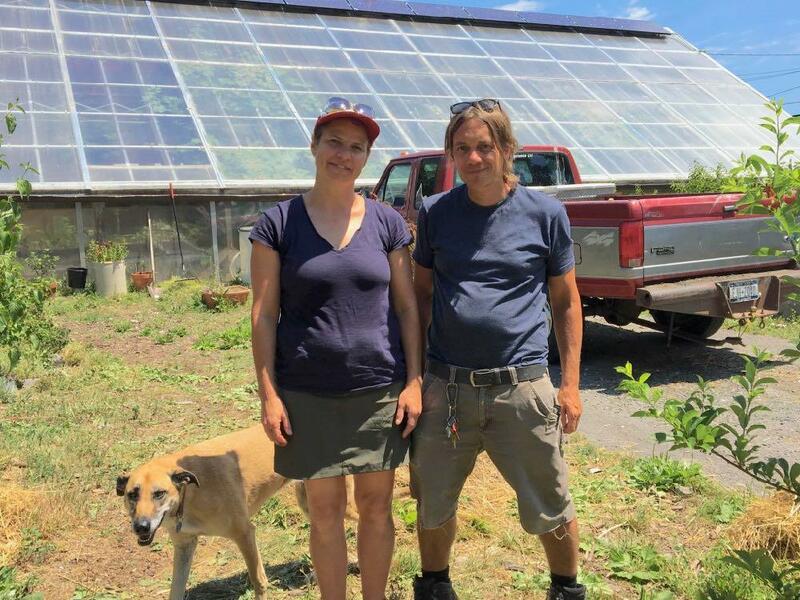 They were in the midst of constructing an 18-foot greenhouse on a corner of Grand Street in Albany's South End. Almost a decade later the greenhouse is overflowing with plants, they're selling fish and watercress, running a composting business, raising animals, partnering with neighborhood organizations, and teaching students and city dwellers about their connection to nature -- all while raising two daughters and working on their PhDs. And still, they found time to talk with us about how things at Radix are going. While the longhorned tick has transmitted disease to humans in other parts of the world, more research is needed to determine whether this can happen in the United States. Regardless, New Yorkers should continue to take steps to protect themselves, their children and their pets against ticks and tickborne diseases that are present in New York State. This tick is also a concern for the New York State agricultural industry and may pose a threat to livestock. 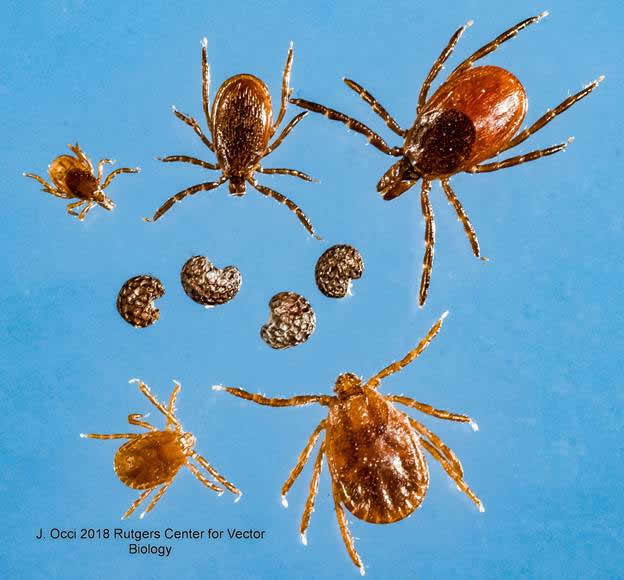 Farmers should continue to work with their veterinarians to check their animals, particularly cattle, sheep and horses, for exposure to ticks and to ensure their parasite control plans are up to date and working. Symptoms of tick-borne disease in cattle include fever, lack of appetite, dehydration, weakness and labored breathing. The Adirondacks -- the High Peaks especially -- have been a very popular spot for hikers over the last decade or so. And that's resulted in all sorts of related issues, from crowding to trash to parking problems. 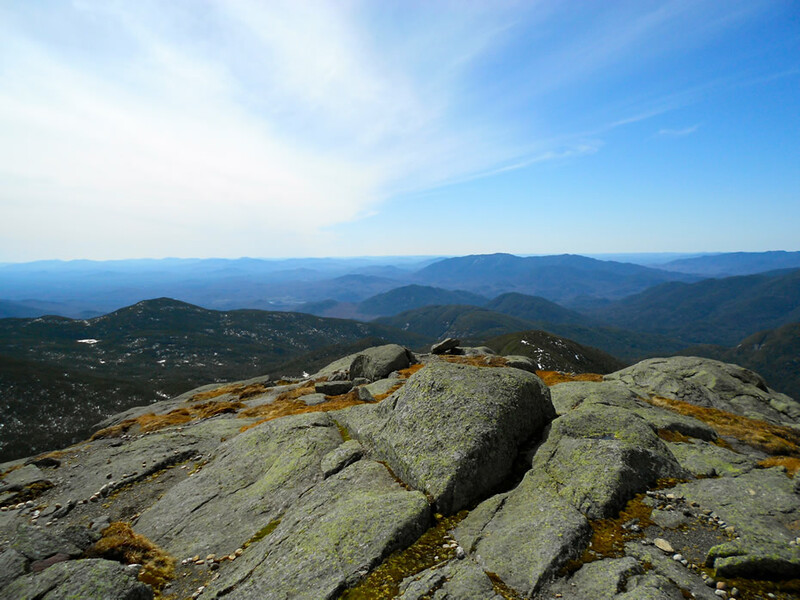 Popular destinations on DEC lands within the Adirondack Park such as the High Peaks, Dix, Giant and Hurricane Wildernesses, Baxter Mountain, and the Saranac Lake 6'er peaks, are attracting an unprecedented number of users. To improve public safety and reduce impacts to natural resources in the area, DEC held four focus group meetings this past winter to generate ideas and information to support recommendations, particularly to address overuse challenges in the High Peaks region and the Route 73 corridor between Exit 30 of the Northway and Lake Placid in the Adirondacks. The meetings were held in partnership with the towns of Keene and North Elba and involved a wide range of stakeholders. With input from DEC land managers, the meetings helped the agency identify specific strategies and actions to be taken in 2018 and 2019. This might not be the claymation that we want, but it's the claymation that we need. Ticks and the diseases they carry are a big problem in this part of the country. And just last week the Cuomo admin a announced a new round of increased efforts to address the proliferation of ticks and the diseases they spread, such as Lyme. But back to the video clip... It was created by Max Helmberger, an entomology grad student. Here's a Cornell news article about his work. And, yep, he has more claymation science videos on Youtube. * Integrated pest management is a fascinating topic. It's basically about how humans can better deal with things like insects and weeds and plant diseases in ways that hurt the environment as little as possible. 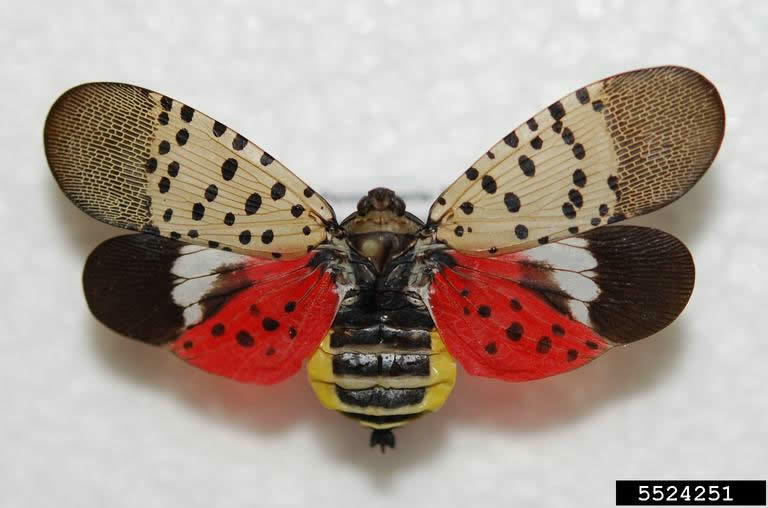 There is an insect called the spotted lanternfly. It's an invasive species here in the United States. And the state Department of Environmental Conservation would like you to report if you see one around here. Ew. Also: the term "sucking mouthparts." 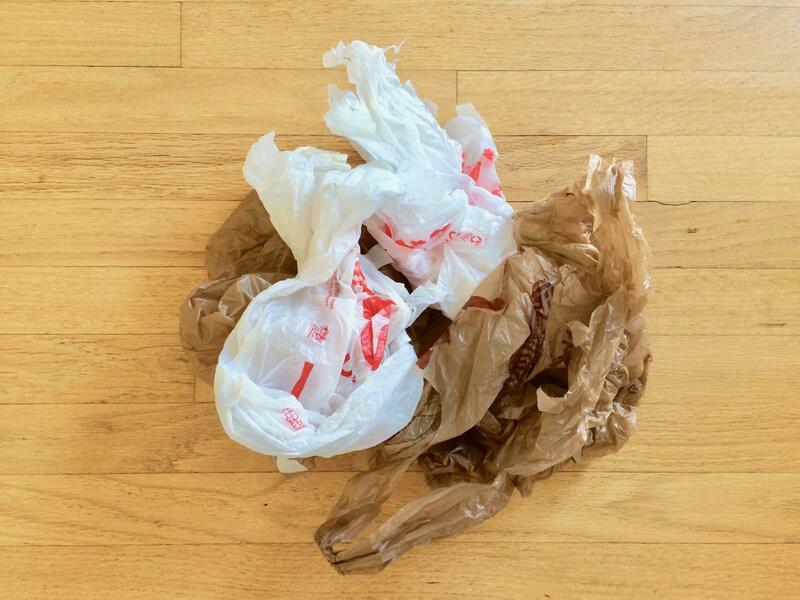 An end for plastic shopping bags in New York? This prohibition does not apply to (i) a reusable bag that is not made of film plastic or a compostable bag; (ii) a plastic bag used solely to contain or wrap uncooked meat, fish, or poultry; (iii) a plastic bag used by a customer solely to package bulk items, such as fruits, vegetables, nuts, grains, or candy; (iv) a plastic bag used solely to contain food sliced to order; (v) a plastic bag used solely to contain a newspaper for delivery to a subscriber; (vi) plastic bags sold in bulk; (vii) a plastic bag prepackaged for sale to a customer including, but not limited to, a trash bag and a food storage bag; (viii) a plastic garment bag; (ix) a plastic bag provided by a restaurant, tavern or similar establishment to carry out or deliver food; or (x) any other bag exempted by the department in regulations. 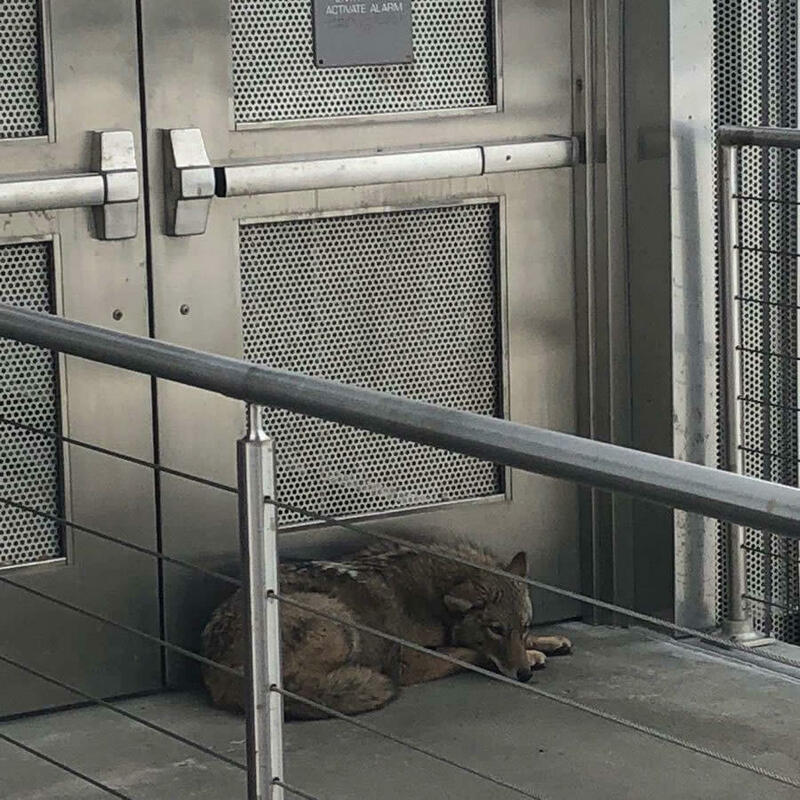 Good news: The state Department of Environment Conservation says the coyote removed from the State Museum terrace Tuesday has been released back into the wild. There's a photo and video from the release below. 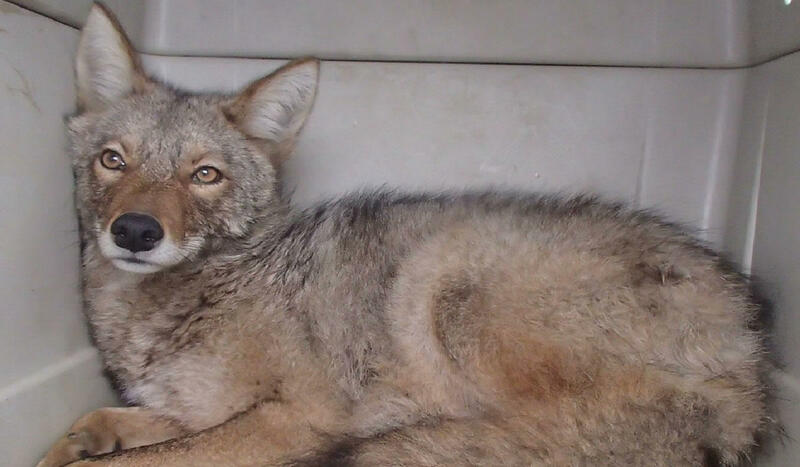 DEC says biologists at the agency's Wildlife Health Unit in Delmar checked out the coyote before the release Wednesday morning and concluded the animal was in good health. As we noted yesterday, it's not all that surprising that a coyote would turn up around the Empire State Plaza -- they slip through urban and suburban areas often. But finding one hanging out in a place like that during the day is odd. So what happened? A photo posted by NYS Police on Twitter Tuesday. A thing that happened Tuesday: A coyote -- an actual, living, wild coyote -- found its way up onto the terrace of the State Museum around noon. That a coyote would show up around the State Museum -- or anywhere in Albany -- is actually not that surprising. That it would end being noticed is more so. PowerPoint presentation on Community Solar. High Peaks Solar, Hudson Solar and Monolith Solar will be present to answer questions about their community solar farms and onsite solar installations for NYSEG and National Grid customers. You will be able to sign up for a renewable energy electricity supplier. The event is Wednesday, March 28 from 6:30-8:30 pm. The East Greenbush Methodist Church is at 1 Gilligan Road. 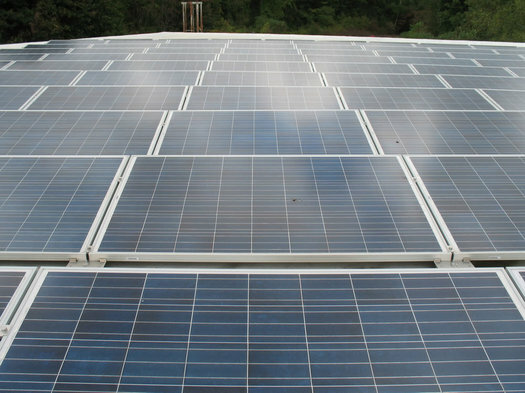 Getting solar panels for your home could be a lot more affordable than you might think. The price of solar panels has been dropping quickly in recent years. And tax credits from the federal government and New York State can cover more than half the cost. Depending on the circumstances -- size of system, location, electricity usage -- the pay back can be in the 6-7 year range. If you're thinking about getting solar, it's worth checking in with the Solarize Albany group, which offers information about sorting through options and organizes group buying discounts. Its upcoming 2018 campaign will include a focus on solar for affordable housing. 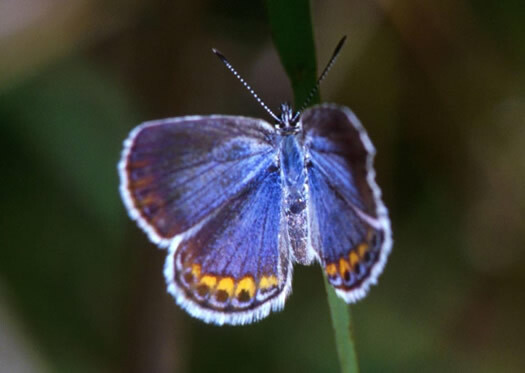 The Albany Pine Bush is an unusual example of an inland pine barrens, and it's one of the few homes to an unusual inhabitant: The tiny, beautiful -- and endangered -- Karner Blue butterfly. And it's making a comeback. The Albany Pine Bush Preserve Commission announced Thursday that conservation efforts in recent decades have apparently had a big effect on Karner Blue populations in the Pine Bush. In 2007, the preserve was estimated to have fewer than 1,000 of the butterflies. And in 2016: more than 15,000. This part of the country -- the whole Northeast, really -- is a hot spot for Lyme disease. The map* above depicts the average number of Lyme cases** reported in each county each year between 2011-2015 -- the numbers are published by the federal Centers for Disease Control and Prevention. There's a larger, clickable national map after the jump if you'd like to explore further. The Northeast US is looking at average temperature rises of a few degrees over the next century because of climate change, according to the some of the best estimates. And while an increase of, say, 4 degrees might not sound like much, it's setting up a future in which the extremes are likely to be more extreme and more common: hotter heat waves, bigger rainfall events, more common floods. Radley Horton, a climate scientist at Columbia University's Center for Climate Systems Research, was at UAlbany this week for a program about extreme events prompted by climate change and their effects on human health. We got a chance to talk with him for a few minutes about how climate change is already affecting this part of the country, what could be ahead, and how we might adapt. An interesting thing about the way the landscape of the Northeast has been changing over the last century is that the amount of forested land has actually increased as many areas that were once cleared for farming have fallen back into being covered by trees. These new forests aren't exactly like the old forests, though. Among the differences: they lack some of the large predators of the past -- notably cougars/mountain lions and wolves. That might not seem like a big deal for humans -- it might even seem like a good thing, considering those sorts of animals can be a bit fear inducing. But one of the side effects is that deer now lack a natural predator, and their populations have exploded. There are so many deer. And they cause all sorts of problems -- from car crashes, to disease transmission, to habitat destruction, to grazing on gardens. So. If we could get some of these predators back in this area -- mountain lions, specifically -- what might that be worth? We've had an unusually dry summer so far, and it's been somewhat hotter than usual, too. And while any one year isn't necessarily a sign of some broader trend, this summer is in some ways an example of what the future summers here might be like because of climate change. We were thinking about that today while looking around the federal government's new Climate Explorer website. It takes projections based on climate change models and greenhouse gas emission scenarios and makes them easy to map and graph for locations around the country. For example: Here's the page for Albany County. So, what sort of future are the models pointing toward for our area? What, your job doesn't involve baby bears? Filed under "jobs we didn't know existed" and "the cuteness is too much": Biologists with the state Department of Environmental Conservation have been visiting bear dens around the state to gather data about bear populations in New York. And that process involves (temporarily) removing bear cubs from the dens so they can be weighed. The 173-pound sow was ear-tagged and fitted with a GPS tracking system collar. The collar collects GPS points at set intervals, then sends the location via text messages - so even bears are getting in on texting these days! DEC staff carefully monitored the sow's vitals during the process. The bandana is used to protect her eyes while she is immobilized. During this time, the three cubs were ear-tagged and weighed only. There were 2 males and 1 female bear cub. The cubs were fairly small (3-4 pounds each) and healthy, probably meaning they were born in late January. After the work was done, the sow is placed back in the bear den with her cubs, where they will stay until the cubs are big enough to keep up with their mother in the woods, typically another few weeks. DEC says it will be sharing more from these bear den visits over the next week. Black bear populations in New York State have "increase[d] dramatically in number and distribution in recent decades," according to state's Black Bear Management Plan published in 2014 -- and there are now more than 6,000 bears estimated to be in the state, across large portions of upstate. The Atlantic sturgeon is an iconic species for the Hudson River -- it's the fish depicted in the logo for the river's estuary, it was once a favorite food in this area known as "Albany beef," and they can grow up to 8-feet-long. The last century has been rough on the species, though -- the population has declined significantly the fish are now considered endangered. But the state Department of Environmental Conservation reports this week that there are indications that Atlantic sturgeon populations are rebounding. DEC says a survey of the Hudson River last year found the highest numbers of sturgeon in the survey's 10-year history -- and there appears to be an overall upward trend. Said acting DEC commissioner Basil Seggos in a press release: "We are cautiously optimistic that, with our continued vigilance and efforts to protect this species, Atlantic sturgeon will have a secure future." The decline of Atlantic sturgeon populations prompted a 1998 moratorium on fishing them along the East Coast. And that ban could last until the late 2030s because sturgeon can live as long as 60 years, and don't reach maturity until 11-21 years old. "Fisheries biologists talk about [the overfishing of Atlantic sturgeon] like clear cutting, which I think is an apt analogy. You wouldn't think you could go into a wood lot and cut all the trees every five minutes and expect there to be a forest there any longer. Everybody understands it takes so many years for a baby tree to grow up. It's the same way with the sturgeons. When we started fishing them real hard it was like someone went into the woods and cut all the trees." And now it appears the forest of fish is starting to slowly grow back. 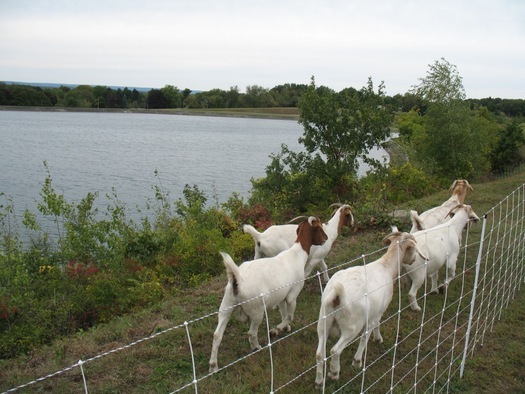 A month ago the Albany Water Board announced it had hired (so to speak) five goats to clear a brush-covered section of the land around the city of Albany's Loudonville Reservoir. A strip along the eastern edge of the reservoir had become choked with a tangle of trees, bushes, and vines -- and the slope of the land made it hard to work on, especially since debris would have to be kept out of the reservoir. Apparently it was difficult enough that the water board had trouble finding a contractor willing to take on the tricky task. Enter the five goats from Heather Ridge Farm as a sort of test of the concept of goatscaping. So, how'd that turn out? It can be hard to hire a contractor. Sorting through all the various options. Coordinating calls and appointments for estimates. Trying to pick the best person. 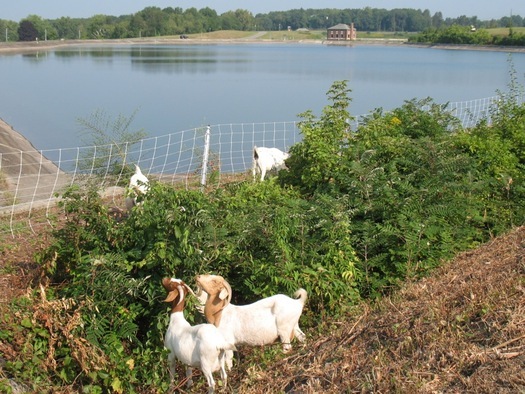 And what if, as the Albany Water Board recently decided, the best person for the job is... a goat? Albany's city forester says the ash trees in Townsend Park will probably have to be taken down. Trees are often one of those things you don't really have a real sense of until they're gone. It's remarkable how much emptier, starker, hotter a street can feel after a few longstanding trees are taken down. The city of Albany is facing the possibility of experiencing this sort of impact on a large scale. Last year an invasive beetle was detected in the city for the first time and the city's ash trees -- of which there more than 2,000 along the city's streets and in its parks -- are threatened with being killed off. 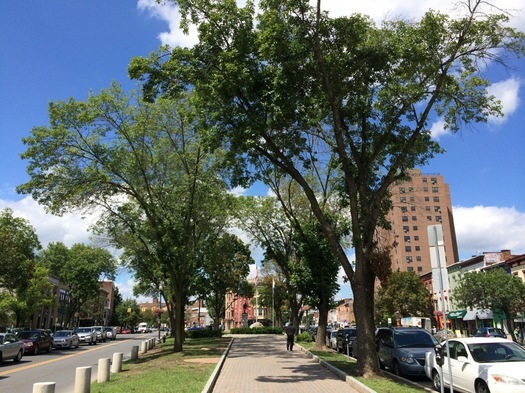 We talked with Albany's city forester, Tom Pfeiffer, recently about dealing with this threat, the problems associated with uniformity, trees that stink, and trees as infrastructure. Can you imagine a New York with temperatures that are more like... Oklahoma? That's one of the comparisons made in a paper published today in Scientific Reports that aims to project how global warming will affect the heating and cooling needs of areas around the United States. 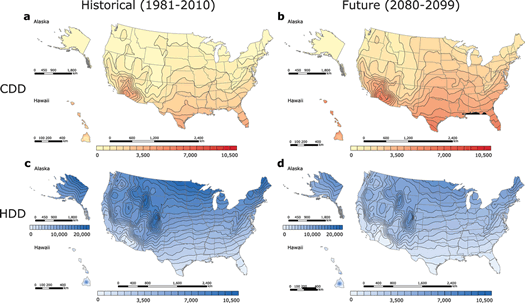 Using a climate scenario that expects global mean surface temperatures to rise by more than 4 degrees Fahrenheit, two Stanford researchers projected how the current "normal" annual number of heating and cooling degree days across the US would compare to levels at the end of this century. The historical CDD [cooling degree day] value of New York City (1,105 CDD) is projected to increase by the end of the century (2,348 CDD), approaching a CDD value that historically prevailed in the hot desert climate of El Paso, TX (2,331 CDD). The historical HDD [heating degree day] value (4,750 HDD) in New York City is projected to decrease (3,126 HDD) to approximately the number of HDD in present Raleigh, NC (3,246 HDD). New York City's historical degree-day sum (5,855 HDDâ€‰+â€‰CDD) will decrease (5,474 HDDâ€‰+â€‰CDD), resembling the historical degree-day sum in Oklahoma City, OK (5,463 HDDâ€‰+â€‰CDD). The researchers used numbers for current normals from more than 7,000 weather stations around the country, so they were able to make maps based on the projections. One of them -- showing projected differences in cooling and heating degree days across the country -- is above. A bigger map, which we think illustrates things a bit better, is after the jump. And it illustrates that the Albany area is, of course, not exactly like New York City. But the general trend is projected to be about the same -- fewer heating degree days, and a lot more cooling degree days. We had a special visitor at Lock C-1 (Halfmoon) over the weekend! 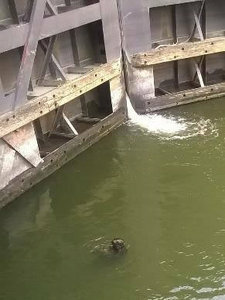 A seal swam up the Hudson River and locked through the federal lock at Troy before visiting us on the Champlain Canal. Thank you The Riverhead Foundation for Marine Research and Preservation for your guidance as we worked to keep the seal safe. That photo is also from the Canal Corp's FB posting. As it happens, it's not really all that usual to see a seal in the Hudson River around Albany. A seal -- or maybe multiple seals -- have been popping up around Coxsackie the last few years. As you know, the Hudson is open to the ocean at its southern end, and the thought is that seals end up here after after following food up river. Ahead of the Rail, River, Hudson II tour this coming weekend, we have a series of posts focusing on the Hudson River this week. As much as the Hudson River has been revered and treasured by people over the years for its beauty and key role in our communities, it's also suffered its share of adverse impacts during that history. Here's an overview of three significant concerns that environmental orgs flagged about the Hudson River right now. 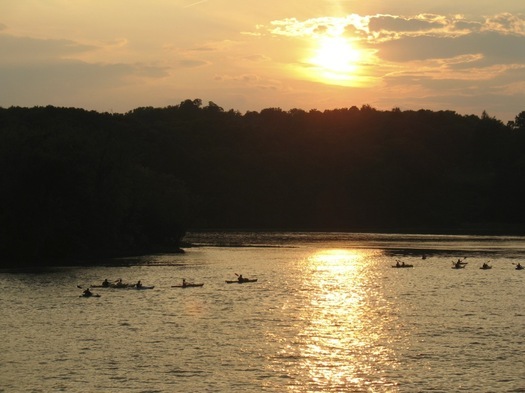 River Week is sponsored by: Albany County Convention and Visitors Bureau, Downtown Albany BID, Dutch Apple Cruises, Harmony Mills, Hudson River Greenway, Nine Pin Cider, Sweet Sue's, and Downtown Troy BID. For some perspective, a megawatt of installed solar is estimated to be capable of powering about 155 homes a year in New York State. New York State has a whole had almost 315 megawatts of installed solar capacity as of 2014, according the Cuomo admin. That's up 300 percent since 2011. A few individual Capital Region counties also ranked highly. Albany County had 13.66 megawatts of installed capacity -- the fifth-highest total among all counties. And Columbia County ranked #1 for installed capacity per capita. It's a long running thread through this area. With the Normanskill in the news this week, we thought it'd be interesting to look into the stream's course through this area -- both in geography and history. We started with the intent of digging up one fact or bit for each mile of the Normanskill -- but, frankly, we lost count. So here is an undetermined number of facts or bits about the Normanskill. 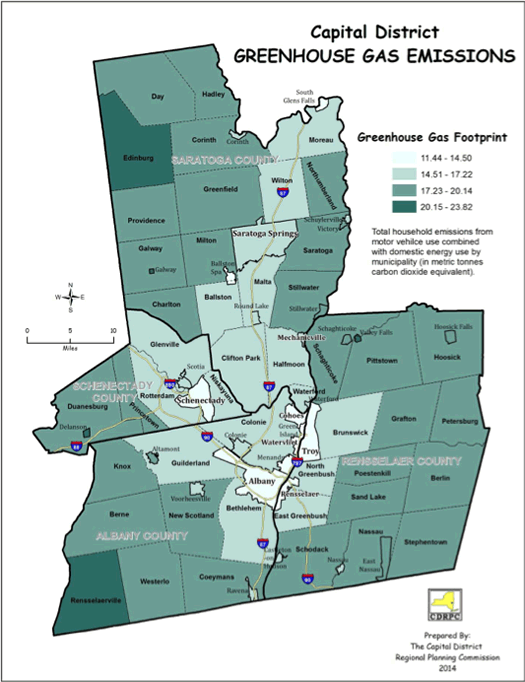 Among the benefits to living near the Capital Region's urban core: on average, your household probably will have a lower greenhouse gas footprint. 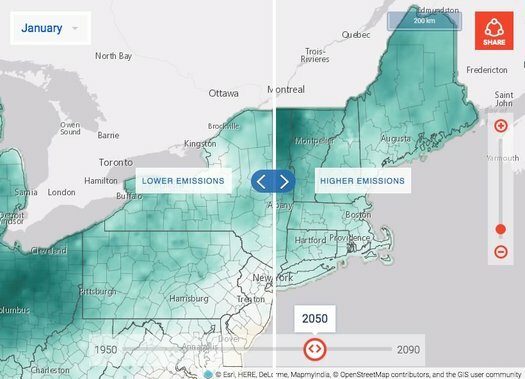 The map is probably what you'd expect -- if a municipality, like the city of Albany, hosts a lot of jobs then its residents are more likely to not have to commute far, and as a result, won't have as large a greenhouse gas footprint. (And you'd probably expect the inverse, too.) In fact, that map matches up pretty well with maps for both daytime population swing and average commute time in the region. Commission report about a regional greenhouse gas inventory. The estimates are explained on p. 19. And the report also includes more, and larger, maps on the topic. One highlight from those additional maps: An estimate of energy costs by municipality (p. 23). The difference between the low and high end is about $8,500 per year. While [acting state health commissioner Howard] Zucker took pains to point out that the data on long-term impacts of hydrofracking is not fully conclusive, he turned personal in his decision. "Would I live in a community with HVHF (high-volume hydraulic fracturing) based on the facts I have now?" Zucker said. "Would I let my child play in the school field nearby, or my family drink the water from the tap or grow their vegetables in the soil? After looking at a plethora of reports ... my answer is no." But fracking also appears to involve some significant environmental risks, especially for ground water, and environmentalists and other advocacy groups have been pushing hard on the Cuomo admin over the last few years to not allow fracking. Mountain lions!? Here!? 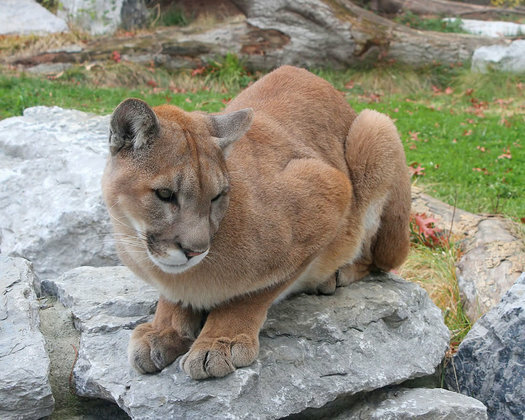 In 2011 The US Fish and Wildlife Service declared that the eastern cougar had likely been extinct since the 1930s. Even so, there have been people -- naturalists, hikers, people drinking coffee on their decks -- who say they've seen one of the big cats in the eastern US since then. And the rather wayward journey of one of the cats through New York and into Connecticut a few years back just stoked those rumors. After covering this topic a bunch of years ago for another outlet, we've thought this was one of those fun mysteries -- the kind of thing people hoped was true. That maybe our part of the world was a little more wild than we all thought. 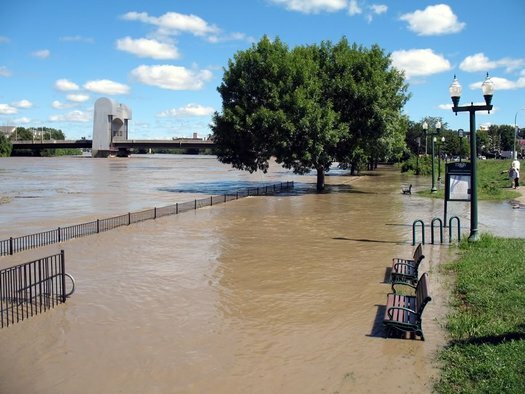 Very heavy precipitation events -- like Hurricane Irene in 2011, which flooded many areas of the region -- are becoming more common in the Northeast, according to the National Climate Assessment. 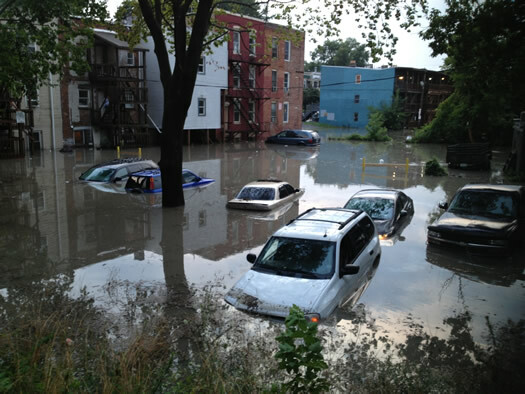 Unusually large rainfall events that result in flooding. Early spring that results in fruit tree blossoms getting zapped by frost. Exceptionally hot days in places where people haven't typically used much air conditioning. Those are a few examples of events that are projected to become more common in the Northeast due to climate change, according to a report out today called the National Climate Assessment. It's the product of a federally-organized effort to "understand, assess, predict, and respond to human-induced and natural processes of global change." See update at the end about Global Partner's announcement that it will require a newer model of tanker car. The Cuomo admin released its report today reviewing how the shipment of crude oil on trains through the state could be made safer. As you know, the Port of Albany has become a major transfer point in the distribution of crude oil from North Dakota. And, because of a string of accidents -- such as a catastrophic explosion in Quebec last year -- the issue has gotten a lot of attention locally. 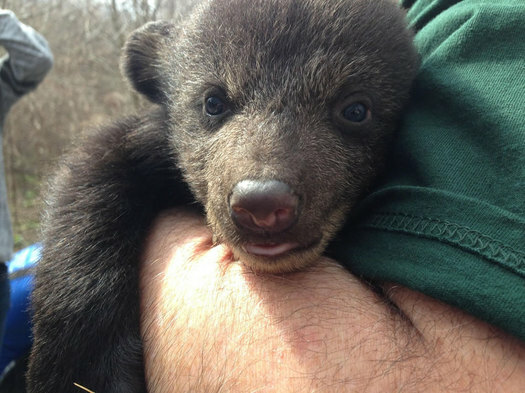 2013 was a good year for New York State bears. Well, it was for some of them. The good news, if you're a bear: The darker shaded parts of the state above probably are good habitat. The bad news, bears: Those are also the places hunters are looking to shoot you. Hunters in New York State killed the second-highest number of bears on record in 2013, according to the state Department of Environmental Conservation. The total: 1,358. + The number of bears killed by hunters in the state has been trending upward over the last two decades. The average number killed from 1991-2000 was 722. Since 2001, it's been 1182 per year. + Hunters killed 35 bears in the Capital Region's core counties last year (Albany: 7, Rensselaer: 14, Saratoga: 14). That's up from 30 in 2012, and 26 in 2011. + DEC says the higher number of bears killed by hunters "reflect that bear populations have increased over the past decade." 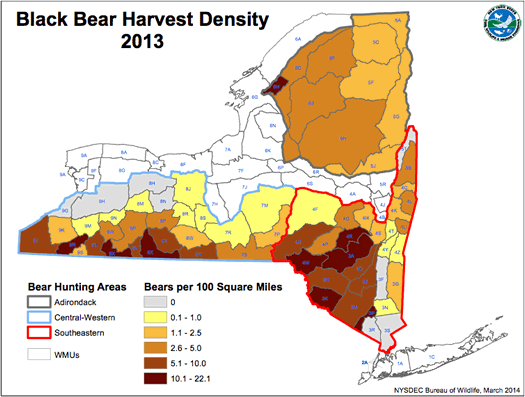 Apparently food for bears was abundant last year.And New York has "excellent bear habitat," according to a statement by DEC commissioner Joe Martens in the press release today. + The state has been opening more areas for bear hunting over the last decade -- including a large stretch of the area east of the Hudson from Westchester up through Washington counties in 2011. DEC says it's currently considering a plan to open all of upstate to bear hunting. [I]t might not be too late for New York, according to the handful of state and federal regulators whose task it is to try to keep feral swine from getting established in the Empire State. From Jan. 28 through Feb. 7, a helicopter crew from the U.S. Department of Agriculture (USDA) is surveying several areas known to be home to feral swine, including part of Delaware and Sullivan counties. 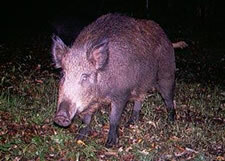 If they spot any feral pigs on land they are surveying, and if the landowner has already given them permission, they will shoot the animals from the air. Kelly Stang, wildlife biologist for the New York State Department of Conservation (DEC), said that to her knowledge, it's the first time in New York State history that government officials have set out to hunt animals by helicopter. But the USDA crew has flown similar missions all across the East Coast. The main purpose of the helicopter flights is not to hunt the hogs, but to find out more about the wily animals and their movements across the landscape. With trees bare and snow on the ground, torn-up ruts in the earth left by foraging swine should be easier to spot. "The crew that's doing it, all they do is aerial operations," Stang said. "The main goal is to survey -- to see if we can find any from the air, where are they, how many. If they do have the opportunity to shoot them, they will take that shot." Most of the feral pigs in New York are Eurasian boars brought here to be hunted. It's now illegal to bring them into the state or breed them. And in 2015 it will be"illegal to possess, sell, distribute, trade or transport Eurasian boars in New York." Feral pigs are causing significant problems in other states -- especially in Texas, which has apparently been fighting a losing battle in the "aporkalypse." A few years back it was estimated that wild pigs were causing $400 million in damages annually. 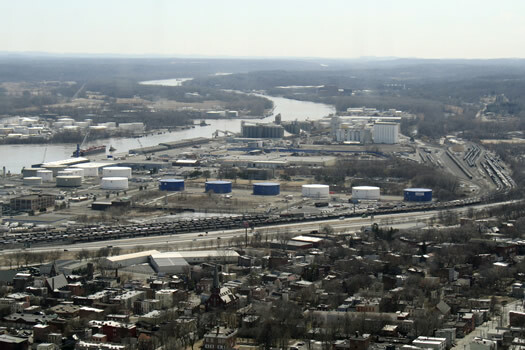 There's been a lot attention recently on the Port of Albany's growing role in the shipment of crude of oil -- and the potential dangers involved. More specifically, a company has proposed building a new facility at the port that could potentially open the way for a different type of oil to be shipped through the port, and that's raised some questions. If you haven't been following this issue -- and we don't really know why you're not thoroughly caught up on petroleum product distribution systems -- here's a Q&A-style breakdown of some of the issues involved -- and why people are concerned. The greener the ZIP, the lighter the carbon footprint. Check it out: The map above depicts the estimated average annual household carbon footprint in New York State, by ZIP code. It's from the UC Berkeley CoolClimate Network, and is based on data from the network's "CoolClimate Carbon Footprint Calculator." If you head over that first link, you can use a clickable version of the map, along with two other maps for household energy carbon footprint and transportation carbon footprint. 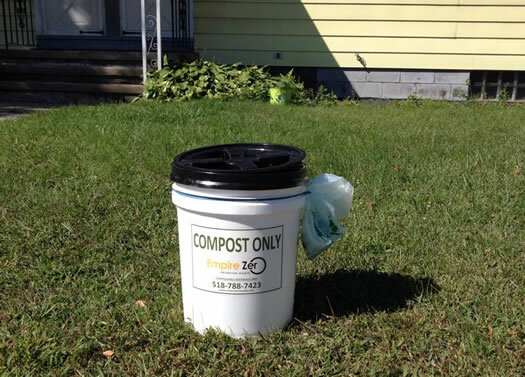 Poking around the Capital Region, it's kind of what you might expect: the more urban areas of the Capital Region tend to score lower carbon footprints than the suburban areas. One of the main reasons? Transportation. Here's an example, from the calculator (second link above): The ZIP codes 12203 (mostly the city of Albany) and 12065 (Clifton Park) are tagged as having roughly similar estimated household carbon footprints for home, food, goods, and services. But there's a relatively large gap for transportation -- specifically car fuel. As a result, 12203 is pegged at 41 tons of C02 per year and 12065 at 49.5. Here's an FAQ about the methodology. The thing that really jumped out to us in all this wasn't the Capital Region, but New York State itself. The Empire State stands out on all three national maps, especially the household energy carbon footprint. One reason: New York State uses very little coal to generate electricity. That's important because electricity from coal has a big carbon footprint. The state's three biggest sources of electricity (in descending order): natural gas, nuclear, hydroelectric. Also helping: New York State had the second lowest energy consumption per person (as of 2010), according to the US Energy Information Administration (that link just above). The EIA notes New York's ranking was "due in part to its widely used mass transportation systems" (mostly in the NYC area, of course). 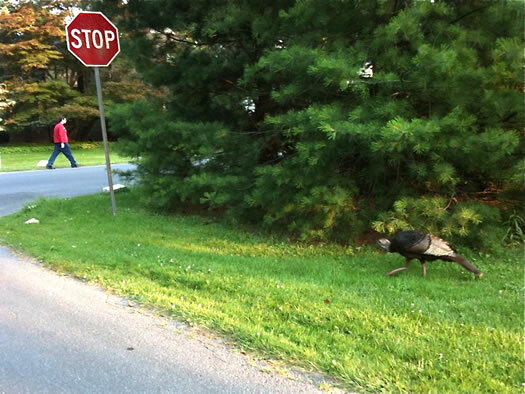 A wild turkey in Albany's Buckingham pond neighborhood in summer 2012. The state Department of Environmental Conservation says wild turkey populations have declined in many parts of the state over the last decade. In an effort to figure out why, DEC is planning to capture some hens to fit them with ID bands -- and in some cases, satellite radio-transmitters. DEC is also asking the public to report wild turkey sightings via a survey. The wild turkey is native to North America. Turkeys were widespread when the Europeans arrived and may have predated the earliest human inhabitants. At the time of European colonization, wild turkeys occupied all of what is currently New York State south of the Adirondacks. Turkey habitat was lost when forests were cut for timber and turned into small farms. The early settlers and farmers also killed wild turkeys for food all year round, since there were no regulated hunting seasons at that time. The last of the original wild turkeys disappeared from New York in the mid-1840's. By 1850, about 63 percent of the land in New York was being farmed. This trend continued until the late 1800s when about 75 percent of New York State was cleared land. In the early 1900s farming began to decline. Old farm fields, beginning with those on the infertile hilltops, gradually reverted to brush land and then grew into woodland. By the late 1940s, much of the southern tier of New York was again capable of supporting turkeys. Around 1948, wild turkeys from a small remnant population in northern Pennsylvania crossed the border into western New York. These were the first birds in the state after an absence of 100 years. The state's wild turkeys are descendants of those migrants from Pennsylvania. In studying what's up with wild turkeys, the DEC shouldn't rule out that the birds have just decided to go back to school (you know, because of the economy). Back in September a turkey expressed interest in attending Mater Christi in Albany. "This magnificent panorama has no parallel in the capital district." The Cuomo admin released the final master plan for John Boyd Thacher and Thompson's Lake State Parks this week. The plan, which follows a draft plan from earlier this year, is like a road map for the future direction of the parks, identifying new uses and facility upgrades along with a general sense of how those developments are prioritized. A quick scan of the highlights are after the jump. They include: a merger of the two parks, a redesigned main park area, rock climbing, cave access, mountain biking, expanded beach area, and new bathrooms. The areas shaded in tan are "100 year floodplains and low-lying areas" after a sea level rise of 6 feet. After seeing this National Geographic continent-level map based on projections of sea level rise from melting ice, we were curious how rises in sea level could affect the Hudson Valley. Over the past century, sea level on the Hudson has risen about a foot--more precisely about 3.2mm per year--a rate greater than the global average. The best data available indicates that we can expect the Hudson's water levels to continue rising up to six feet by the end of this century, and perhaps that much again during the next century. To help people get a better understanding on the implications of the rising water levels, Scenic Hudson has posted an interactive "Sea Level Rise Mapper." It's good -- it allows you to zoom in on a specific area to see what areas will be threatened, along with projected numbers for affected acreage and households, for the Hudson Valley from just north of NYC all the way up to Troy. 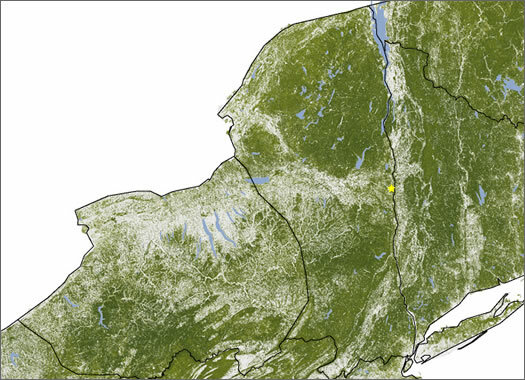 The short story for this area, based on the Scenic Hudson map: Even with a six-foot rise in sea level, many parts of this area along the river would still be protected from permanent inundation (though those low-lying areas of East Greenbush and Schodack along the train tracks get swallowed up). 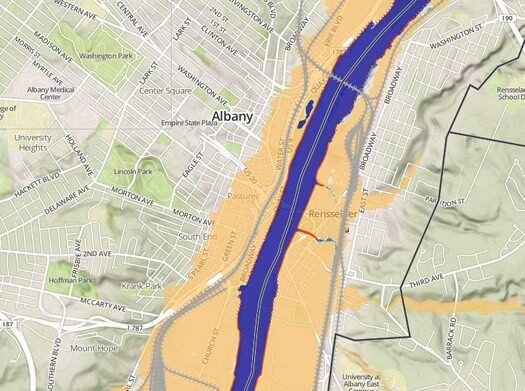 But the area in potential danger during a large flooding event would increase, covering significant portions of Green Island, Troy, Watervliet, Rensselaer, and downtown Albany. The Albany Pine Bush Preserve is a unique ecosystem located on a 3,200-acre site in Albany County, New York. The preserve is one of the best-remaining examples of an inland pine barren habitat. The open areas and well-drained sandy soils of the preserve support a globally-rare pitch pine-scrub oak community and is home to more than 1,300 species of plants, 156 species of birds, 20 species of amphibians and reptiles, and 30 species of mammals, as well as rare species of butterflies and moths. 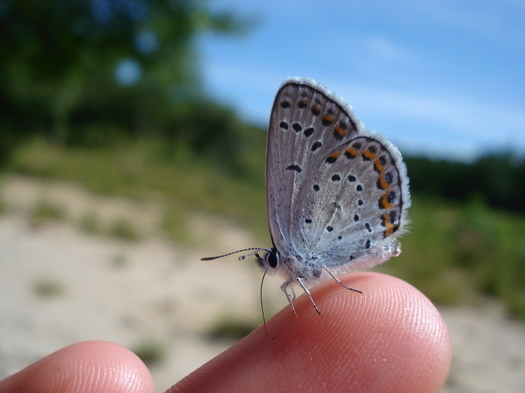 Among its diverse flora and fauna, the Albany Pine Bush supports the federally-listed endangered Karner blue butterfly, as well as the rare inland barrens buckmoth. The Albany Pine Bush is the site of one of thirteen Federal Recovery Units working to rebuild adult populations and restore suitable habitat for the Karner blue butterfly across the range of the endangered species. If anything, the National Natural Landmark designation is another sign that people's perception of the place continues to evolve, to the ecosystem's benefit. The last couple of hundred years haven't been kind to the Pine Bush. It suffered from a rather poor reputation in the 19th century. The Thruway and Washington Ave Extension were plowed through it. A mall was built. A landfill sited in it. It's only in the last four decades or so that momentum has shifted in the direction of preservation. 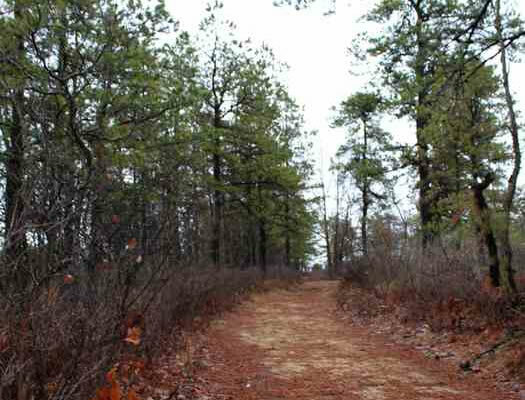 The Pine Bush once covered an area of about 40 square miles -- it's now about 1/8 that size. There are 596 National Natural Landmarks in the US and its territories -- and 27 sites designated as National Natural Landmarks located at least partially within New York State, according to the National Park Service. The list includes two in the immediate Capital Region: Bear Swamp in Albany County, and Petrified Gardens in Saratoga County. It's that gray spot floating the pool of blue in the Adirondacks. There's a statistic that I quote, which is that eight of every ten kids born in the United States today will never experience a sky dark enough to see the Milky Way. The Milky Way becomes visible at 3 or 4 on the Bortle scale. That's not even down to a 1. One is pretty stringent. I've been in some really dark places that might not have qualified as a 1, just because there was a glow of a city way off in the distance, on the horizon. You can't have any signs of artificial light to qualify as a Bortle Class 1. A Bortle Class 1 is so dark that it's bright. That's the great thing--the darker it gets, if it's clear, the brighter the night is. That's something we never see either, because it's so artificially bright in all the places we live. We never see the natural light of the night sky. As Bogard mentions in that clip, there's a scale for night sky brightness, the Bortle scale. Nowhere east of the Mississippi qualifies for the very darkest category. But we're not too far from a few spots that qualify as pretty darn dark (a scientific term). According to maps created by The World Atlas of the Artificial Night Sky Brightness based on satellite data, there's a patch in the middle of the Adirondacks that qualifies for the second-darkest category on the scale used by the atlas -- here's a zoomable map. Specifically, the patch is just west of Blue Mountain Lake, around Raquette Lake. It's about 135 miles from Albany. It's not surprising the Adirondacks have a spot like this -- it's one of the least-lit places in the eastern United States. Reported cases, year by year, from 2001-2011. Maps: CDC. This is sobering: The federal Centers for Disease Control and Prevention had reported that the national number of Lyme disease cases had been about 30,000 per year over the last few years. But this week it reported that preliminary estimates based on new research indicate the number is around 300,000. So... that's a lot more. This early estimate is based on findings from three ongoing CDC studies that use different methods, but all aim to define the approximate number of people diagnosed with Lyme disease each year. The first project analyzes medical claims information for approximately 22 million insured people annually for six years, the second project is based on a survey of clinical laboratories and the third project analyzes self-reported Lyme disease cases from a survey of the general public. Each year, more than 30,000 cases of Lyme disease are reported to CDC, making it the most commonly reported tick-borne illness in the United States. The new estimate suggests that the total number of people diagnosed with Lyme disease is roughly 10 times higher than the yearly reported number. This new estimate supports studies published in the 1990s indicating that the true number of cases is between 3- and 12-fold higher than the number of reported cases. CDC says the three studies are still ongoing and it continues to analyze the data to "refine the estimates and better understand the overall burden of Lyme disease in the United States." 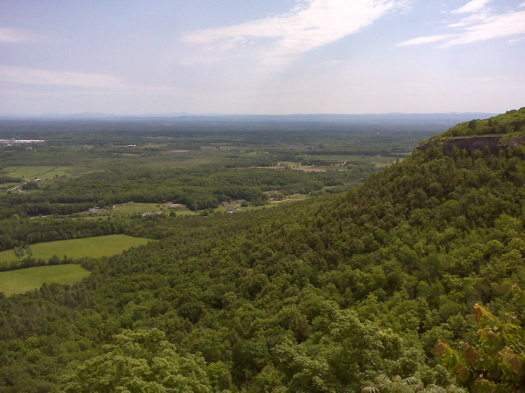 As the draft plan notes: Thacher Park's "magnificent panorama has no parallel in the capital district." The state Office of Parks, Recreation & Historic Preservation is currently in the process of planning a bunch of upgrades for John Boyd Thacher and Thompson's Lake State Parks. The draft plan is wide ranging, from relatively straightforward and much-needed stuff (like new bathrooms) to a redesign of the some of the park's most-used areas. Also part of the proposed plan: officially combining Thacher and Thompson's Lake into one park. A lot of the changes wouldn't happen overnight -- the plan's timeline could extend as long as 15 years. And, of course, everything is subject to the availability of funding. There's a public hearing on the proposed master plan for the parks this Thursday (August 1) at the New Scotland town hall at 7 pm. The planning docs are posted online. We read them through them this afternoon and pulled a few quick-scan highlights. An adult periodical cicada. The red eyes really make the look. 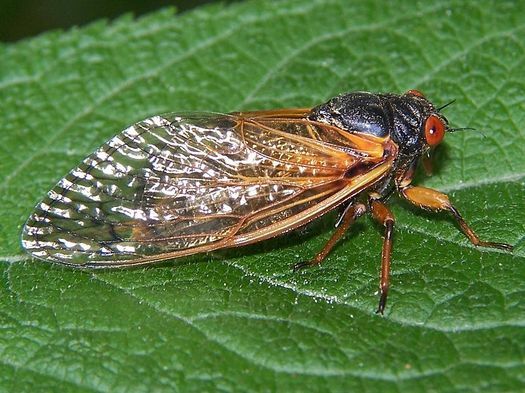 Perhaps arriving soon: the periodical cicada. A "brood" of the fantastically weird insects -- that climb from the ground every 17 years to molt, sing, mate, lay their eggs, and die -- are emerging along the East Coast this month. And we could see some of them in the Capital Region. This particular cohort of cicadas -- Brood II, or "The East Coast Brood" -- last emerged in 1996. In previous appearances, its range has stretched from North Carolina to northern New York. In this class, Scott Kellogg and other sustainability experts give attendees a "toolbox" of techniques and knowledge usable by anyone wanting to create sustainable systems in their own communities. Through a combination of group hands-on activities and lectures, participants will learn how to build infrastructure for self-reliance that is simple, affordable, and replicable. These systems can be applied in either urban or rural environments. 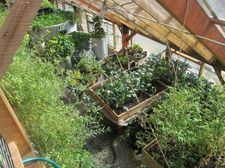 The topics range from aquaponics to beekeeping to vertical farming to vegetable oil vehicles. The cost for the workshop $150-$350, and includes meals. Space is limited. The Albany County Department of Health reported today that a woman in Cohoes was bitten by a potentially rabid grey fox this morning (area map). The fox got away, and officials are urging people to keep an eye out for wild or stray animals that are acting strangely -- and call 911 if one is sighted. Rabid foxes turn up now and then in this area. Three foxes tested positive for rabies between January and October of 2012 -- one each in Albany, Rensselaer, and Saratoga counties -- according to the most recent data posted by the state DEC. There were also three positives in 2011 -- two in Saratoga County, and one in Schenectady County. Statewide that year there were 26 positive tests for rabies in foxes, 21 of those in grey foxes. Richard Leddy, 40, said he was lying on the town beach reading when he heard someone in the water say, "Oh look, there's a fox." "I thought they meant on the other bank, but then I heard a snarl and looked over to see the fox in mid-leap," Leddy said. "Next think I knew he'd sunk his teeth into my arm." In fact, the last two people to die of rabies in New York State -- in 1995 and 1993 -- got it from a bat, according to the state's Wadsworth Center. They find the weather strange, too. Only time and continued monitoring will determine if the late 2012 hatch will have an impact on the 2013 butterfly population and the longer-term recovery of the species. "We had no idea a third flight in a single season was possible before 2010" said [Albany Pine Bush Preserve Conservation director Neil] Gifford. According to Gifford, it was in 2010 that Karner blue butterfly managers from Wisconsin to New Hampshire suspected that the late season adults they were seeing may be a previously unknown third flight. "We don't yet have a good understanding of what the implications of a third brood will mean for the recovery of the species" said Gifford, adding "it will likely depend on whether the changing climate brings such conditions more frequently." The preserve says this spring's emergence of Karner Blues was the earliest on record -- 10 days earlier than the previous record, and 21 days earlier than the 20-year average. "This is a very exciting, and very limited chance to see this Federally endangered butterfly," says Discovery Center Director Jeffrey Folmer. "One question visitors often ask is 'Where can I see the Karner blues?' These beautiful, but tiny butterflies are rare, hard to spot, live only three to five days and are difficult to distinguish from other similar non-endangered butterflies. We now have 600 of them emerging from their chrysalises one by one and they're on view until they all emerge." The commission says butterflies will available for viewing at the Albany Pine Bush Discovery Center until mid-July. Admission is free. The Albany Pine Bush -- a sandy inland pine barren -- is one of the Karner Blue's native habitats (there aren't many remaining). In fact, the butterflies are called "Karner Blues" because of the no-longer hamlet of Karner, New York. Vladimir Nabokov -- yep, the author -- stopped to study the butterflies there in 1950 and ended up naming them. Nabokov once described the insects as being "like blue snowflakes." The Sewage Pollution Right to Know Act, once signed by the Gov. Andrew Cuomo will make public reporting about unsafe water conditions nearly as routine as severe weather warnings. The law will require public wastewater treatment plants to publicly disclose within four hours of releasing raw or partially-treated sewage. The state will also for the first time report annually on reported sewage discharges. This is an important issue around here because of something called "combined sewer overflows" (CSOs). Basically, when many of the antiquated sewer systems in this area become overwhelmed with storm water, they start dumping the excess -- sewage and all -- into the Hudson and its tributaries. Yep, eww. Riverkeeper did testing last year for sewage-indicating bacteria in Hudson -- and two of the worst spots for contamination were near Albany (Island Creek/Normans Kill in Glenmont, and the Dunn Memorial Bridge). 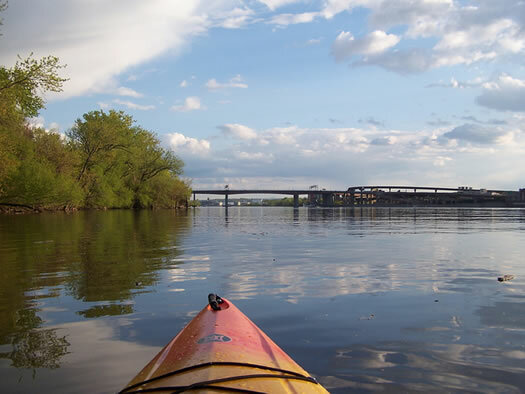 The org reported that the Capital Region's CSOs "dump an estimated 1.2 billion gallons of combined sewage and wastewater into the Hudson each year." Reported cases, year by year, from 2001-2010. Mappage: We came across this CDC map of reported Lyme disease cases over the last decade (ending in 2010). The CDC site allows you to switch from year-to-year -- we piled all those years into the animation above. The thing that struck us about the map is the way it illustrates how Lyme has spread from the coast and the very central part of the Hudson Valley to the entire Northeast (as well as Wisconsin and Minnesota). As it happens, the number of reported cases in New York was down noticeably in 2010, the last year for which the data's posted by the CDC. The state's incidence rate that year -- confirmed cases per 100,000 people -- was 12.3 that year (12th highest in the country). It was 21.2 in 2009, and 29.5 in 2008. Delaware led the nation in 2010 with a rate of 73.1. Vermont's rate was 43.3 that year, and Massachusetts' 36.3. All this attention? For me? 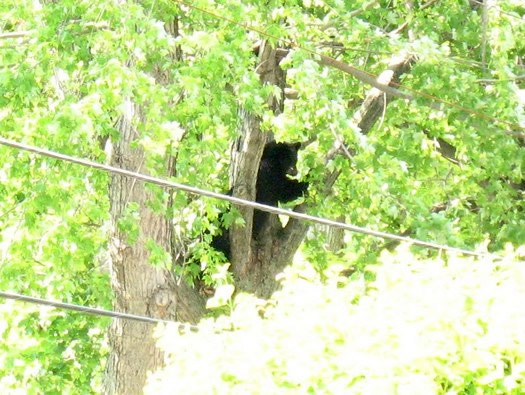 After spending most of Wednesday hanging out in a tree, the North Greenbush bear finally came down shortly after 4 pm. It wasn't by choice -- he had been hit with a tranquilizer dart -- but it was a soft landing, apparently. "This guy went down pretty good," said NYS DEC police lieutenant Jim Hays shortly after the landing. Hays said the bear appeared to hit the ground softly while zonked on tranquilizers. "They're like a big bowl of jello when they land." The black bear had climbed a a large tree in the front yard of a house on Meadow Dr, just across Williams Road from the North Greenbush Town Park. DEC had originally planned to let the bear come down on his own. But after he seemed content to sit in the tree for hours, DEC decided it was time to move things along. Hays said they were worried about the situation becoming a public safety issue. Williams Road was filling with rush hour traffic. A large crowd of media and onlookers had gathered just on the other side of road. And Hays said people had started to circle around the scene for a better look, cutting off potential escape routes for the bear. "We need to learn how to live with them," Hays said, describing Albany and Rensselaer counties as bear country. "They're not going to go away." As with the other recently captured bears, DEC will keep the North Greenbush bear overnight for observation. If he checks out OK, Hays says they'll take him some place more bear appropriate and release him. There are a bunch of photos from today's scene after the jump. Perhaps most worrisome is their reputation as eating machines: the pigs devour ground-nesting birds and reptiles, fawns and domestic livestock, native vegetation and crops. Feral pigs have already proliferated in parts of western New York. But state officials are drawing a line in the topsoil, so to speak, determined to protect both the agrarian economy and the fragile ecosystem from the nascent herd -- or "sounder" in swine-speak -- in the town of Peru. "There's a real sense of urgency," said Ed Reed, a wildlife biologist for the state's Department of Environmental Conservation. "Once the pigs get established, they are very difficult to eradicate completely." And what are they using to lure the pigs into traps: Jello-laced donuts. The DEC says "people with a small game license may shoot and keep feral swine at any time and in any number." The resulting pork is said to be rather tasty -- although in some cases apparently there isn't enough sage to cover up the stink. Feral pig populations are widespread in the South and California -- causing so many problems, in such great numbers, that as an official remarked: "With over 2 million hogs in Texas, we're not going to barbecue our way out of this problem." The animals reportedly cause $400 million in damage there each year and people have resorted to shooting them from helicopters. New York State's 2011 bear "harvest"
The state Department of Environmental Conservation reports there were 1258 bears killed by hunters in New York in 2011. That's up about 18 percent from 2010 -- and higher than the five-year average (1,152) -- but short of the record on the books (1864 bears in 2003). Last year's total did include a record number for the sub area that covers part of the Capital Region. The DEC attributes the record to bear hunting being opened in counties stretching from Rockland and Westchester counties north to Washington County. The cover of the DEC report includes a photo of a hunter with a bear killed in Columbia County, which the agency says might have been the first bear taken in the county since the 1800s. There were 26 bears killed in the Capital Region's core counties last year: Albany (4), Rensselaer (11), Saratoga (11). Counties in the greater Capital Region: Columbia (10), Greene (68), Schoharie (19), Washington (20), Warren (27). 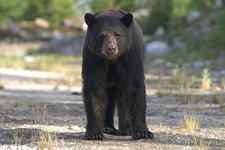 In recent years DEC has said that bear populations in the state are "thriving." By the way: the word used by the DEC to describe a year's take of bears (and deer) is "harvest" -- which makes sense. But it always makes us think of a field of bears growing in rows. And we suspect the bears have a different word for it. Where electronics start their afterlife. Electronic gadgets are everywhere -- and in greater numbers every day. It's one side effect of an industry in which an item is considered "old" if was released just a year ago. So, these items often have a short lifespan. And when the end comes, they have to go somewhere -- and increasingly, that place is not a landfill. As of the start of this year, businesses and municipalities in New York State are no longer allowed to pitch electronics into landfills. And by 2015 that restriction will apply to everyone -- even individuals. 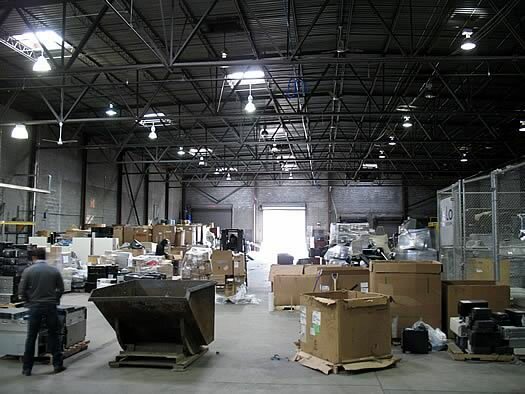 With that in mind, a recent invitation to check out an electronics recycling business in south Troy made us curious to see where this stuff goes. Well, that, and we almost never pass up the opportunity to see stuff get crushed. 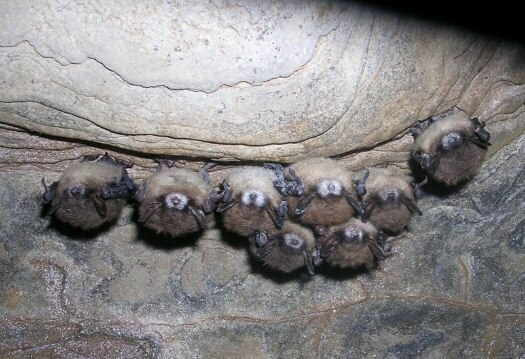 Bats with White Nose Syndrome in Hailes Cave in Albany County. The disease was first identified in Howes Cave in Schoharie County -- it spread to other caves in the region and large bat die-offs followed. Bats don't necessarily have the best reputation with a lot of humans, but they're an important part of the ecosystem because they eat huge numbers of insects -- including mosquitos. Forestry fact of the day: the Adirondacks are one of the areas with the most tree mass in the country, according to a map of "above ground woody biomass" created by the NASA Earth Observatory. A clip from the map, of New York State, is above. The darker the green, the more tree mass there is. The national map is posted after the jump in large format. You can see the large swath of forest that runs from Maine, through New Hampshire and Vermont, includes eastern New York, and then runs along the Applachians. And as dense as parts of the swath are, the long, narrow (relatively speaking) forests of the West Coast still trump the East for density of tree stuff (the trees are rather large out there). Researchers built the map as part of an effort to better understand how much carbon is stored in forests -- and which way that amount is trending. The Hudson River at the Dunn Memorial Bridge was among the 10 worst spots in the study. The environmental org Riverkeeper released a report this week on Hudson River sewage contamination levels -- and the results for this part of the Hudson were... uh... gross. Riverkeeper's testing found sewage-indicating bacteria levels were above acceptable limits more than 50 percent of the time at both Island Creek/Normans Kill in Glenmont (65 percent of the time) and the Dunn Memorial Bridge in Albany (50 percent). Those two spots were among the top-10 worst of all the spots tested. The data for all the locations tested are posted online -- and table with local data is after the jump. So, what's causing this problem? The Capital District's combined sewer systems dump untreated sewage into the river when they're over capacity (example: after a heavy rain). 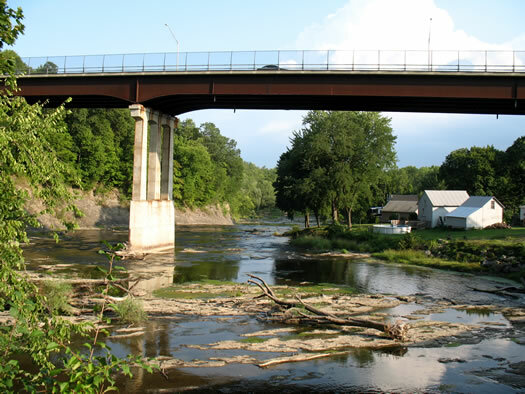 Riverkeeper says the systems release 1.2 billion gallons of untreated sewage and wastewater into the river each year. Nabokov once described the a group of Karner Blues appearing like "blue snowflakes". The first flight of Karner Blue butterflies should be appearing in their habitats around the Capital Region right about now. The beautiful endangered butterflies hang around sandy pine barren habitats. Two such spots in the Capital Region: the Albany Pine Bush Preserve and the Wilton Wildlife Preserve. Drew was at the Wilton preserve this past week and said the butterflies were easy to spot. Karner Blues congregate in these habitats because they're also the habitat for blue lupine. The butterflies lay their eggs on the plants. There's some great history Capital Region history involving the Karner Blue. The common name of the butterflies is linked to a spot here -- and Vladimir Nabokov classified the butterflies. Yep, the author. In the event you were holding out on learning about hydrofracking until it was all set to music, your moment has arrived. The video embedded above was produced by NYU students as part of a collaboration with the journalism org Pro Publica. Hydrofracking is potentially one of the biggest environmental issues facing the state. A rather large deposit of hard-to-reach natural gas runs through the state. And energy companies are reportedly eager to give it a good fracking. That could mean significant economic gain -- and significant environmental problems. Pro Publica has been all over the issue. Oh, and that part about flammable water -- true, in some cases. Sheep -- and dogs -- will be working to clear invasive plants from the Normanskill Farm. There's a new (old) way to combat invasive plant species in upstate New York: small flocks of sheep. 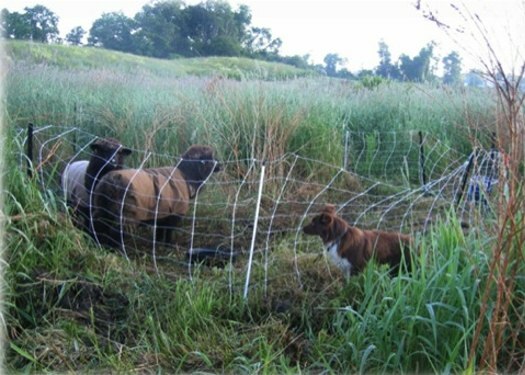 Gary Kleppel, a professor of biological sciences at UAlbany and director of the Biodiversity Conservation and Policy Program there, is in the process of setting up a "targeted grazing" project using sheep at Albany's city-owned Normanskill Farm. His sheep start arriving in a few weeks and then, with the help of students, dogs, and a fancy fence, the sheep get to work -- eating and gnawing at the plants that cause problems for our ecosystem.